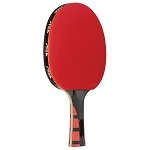 Stiga Table Tennis Tables - T8505 Model STS 510 - Tournament Series. 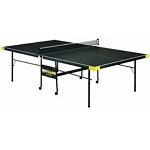 Price includes shipping for this Stiga tennis table when shipping to the contiguous 48 United States. 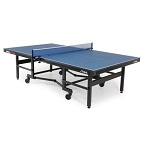 Stiga table tennis tables bring you an affordable game table with top-of-the-line construction and design. The T8505 features the top of the Tournament Series from Stiga. 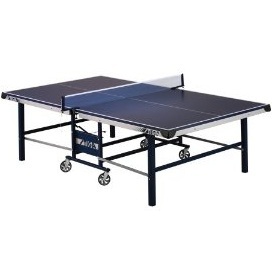 This table has a competition-grade 1 inch wood-composite table top for optimal bounce while playing. This unit comes with a 1-year warranty from Escalade Sports. Table Top material: competition-grade wood composite. 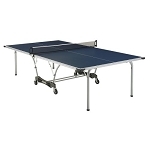 Table top dimensions: 108 inches L x 60 inches W x 30 inches H.
Table top playback dimensions (for solo practicing): 60 inches W x 71 inches D x 74 inches H.
Table folded dimensions: 28 inches W x 60 inches D x 74 inches H.
Corner pads on the tennis table top help to protect players and equipment from impact. Table top color: tournament blue. Extra-heavy-duty steel chassis for added table support. 5 inch Mag Ball-bearings easily role the system to the desired location on just about any indoor surface. 2 inch square self-opening legs. Product package weight: 382 lbs. Package dimensions: 63.50 inches x 56.50 inches x 7.00 inches. Delivery for this product is a curbside delivery. The customer must be present to receive the product and help the driver unload off the truck. Assembled dimensions: 108 inches L x 60 inches W x 30 inches H.
Comes with a 1-year warranty from Escalade Sports. Q: Where can I get paddles and balls for this table? 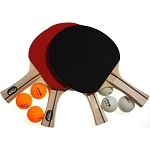 A: Try the T13344-pack table tennis paddles and balls. Dimensions: 64" x 57" x 7"